Since being introduced to land-based casinos, the MegaBucks slot machine became an instant favorite thanks to the massive jackpots it offered. In fact, players can win anywhere from $8 to $39 million on these games, which is definitely a huge reason why slots fans continue to spin the reels on this machine on a regular basis. Like many popular land-based slots, MegaBucks started off as a three reel, single payline game; however, it soon evolved into a 5 reel, 60-payline game. The game is so big that it has generated its own myth. Many casino goers firmly believe in a curse surrounding that game that states that any winner who takes home the jackpot will be struck down by tragedy. Though there is no solid evidence to support this story, the MegaBucks curse has sent shivers up the spine of many dedicated slots fans. It is a progressive jackpot game, which means with each player that puts their money in and doesn't win, the jackpot gets higher and higher. You must put down a wager of $3 to qualify for this massive progressive payout. This 5 reel, 5-payline online slot is all about the money. The reels are filled with such monetary symbols as stacks of cash, suitcases full of cash, cash symbols, golden coins, and safes to name a few. The game offers a wild symbol and a bonus game, though it is the $1 million payout that often attracts slot lovers to this game. 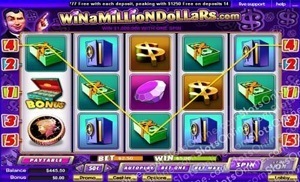 Check out the full Win a Million review or start playing at Go Casino. The Major Millions slots have grown into several different varieties thanks to the huge success of this 3 reel, 3-payline original Major Millions game. 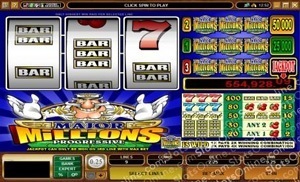 Players attempt to spin in winning combinations of such symbols as Major Millions logos, BARS, Lucky 7s, and cherries. It's a progressive game, which means there is plenty of money to be won when you spin the reels on this online slot. Check out the full Major Millions review or start playing at All Slots Casino. This is an expansion on the first Major Millions game. It's a 5 reel, 15-payline game that features a more in depth military/money theme. The reels are filled with such symbols as jets, tanks, top secret letters, military garb, and many more. The game also offers plenty of bonus features and a top payout worth 800 times your line bet. 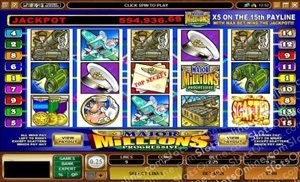 Check out the full Major Millions - 5 reel review or start playing at All Slots Casino. This MegaBucks inspired game offers all types of slot players something a little different. 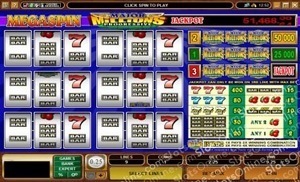 It is a MegaSpin slot, which means that you get to simultaneously spin the reels on six different sets of 3 reel games. In total, that's 18 reels spinning at the same time. There are three paylines in this monster slot and it's a progressive game, which means there is plenty of cash up for grabs! Check out the full Major Millions MegaSpin review or start playing at All Slots Casino.